Three months after Wildflower's Solera beer made its maiden appearance, the Marrickville brewer/blender has released the second pull from its foudre (aka big wooden barrel). And, while it is the second release in the series, it’s arguably the first that really takes in the full spirit of the project by being a blend of old and new beer. The concept for Solera involves pulling half the liquid from the foudre, packaging it, then topping up the empty portion of the barrel with fresh beer. This process is repeated every four months (or thereabouts) so the beer is in a perpetual stage of development and, unusually, gets both older and younger at the same time. Pull #1 was thus, by necessity, a single batch and it came out quite sour, citrusy and with a slightly elevated grain profile. Pull #2 is similar though seems more refined than the first, a bit more integrated. 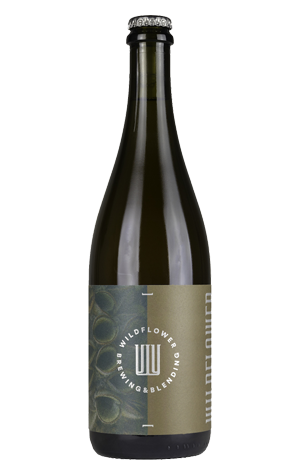 It’s comparable in many ways to the signature base Gold blend with its fragrant citrus fruit aroma and sharp acidity, though there’s perhaps more oak and a more vinous quality on show here – on the aroma at least. The key point of difference with Solera comes though use of spelt instead of wheat and it feels like that’s begun to show itself, adding a different kind of depth that helps the flavours linger a little longer and stronger. There’s something quite captivating about Solera (beyond just the impressive barrel it lives in). Maybe it’s the frequency or scarcity – the fact that it only comes around a few times a year which makes it easier to keep track of and compare mentally. Whatever it is, it’s worth trying now while the beer is still relatively young. Who knows where this journey will go, but it’s going to be fun to follow.